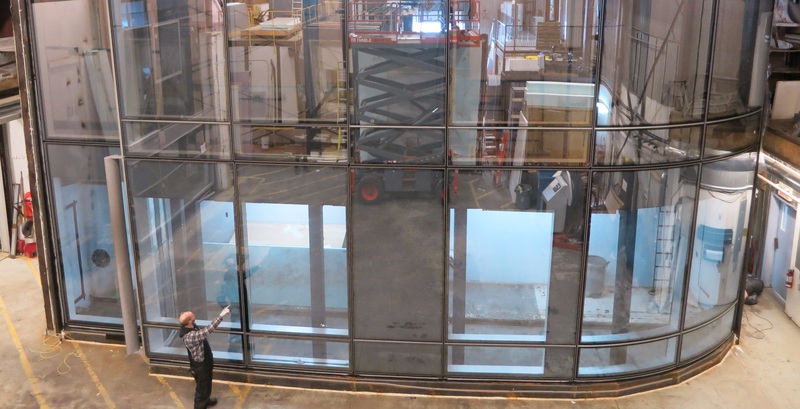 UL now provides the Ontario construction market with performance mock-up testing and fenestration testing at new state-of-the-art facility in Toronto. Provide your customers with confidence that your envelope systems and fenestration products meet the specified requirements! The mock-up laboratory accommodates any full-scale wall assemblies, including window and curtain walls. Located indoors in a 7200 square foot facility, the laboratory is equipped with a 50 ton overhead crane and can test samples up to 40 feet in height, which makes it amongst the largest indoor facilities in Canada. Our team can test for extreme weather conditions ranging from air infiltration, water penetration (static and dynamic), wind loads, thermal cycling, condensation, seismic movement, missile impact, forced entry, and anchor / washer bolt performance. The fenestration laboratory is equipped to test any sample size of windows, doors and skylights for rain, extreme temperatures, sun and high velocity winds including hurricanes and tornadoes. Our dynamic team of highly specialized staff have been serving architects, building owners, manufacturers and installers in the building construction markets for over 30 years. You can rely on our technical experts to test your fenestration products, curtain wall and façade mock-ups to a full range of standards. We are a single gateway to testing and training services dedicated to the building envelope. Our network of technical experts, state-of-the-art test facilities, and long standing relationships with the design and construction community, regulatory authorities, industry technical leaders, trade associations, and universities helps manufacturers gain the compliance credentials they need to compete in a complex global supply chain and the design and construction community. Knowledge You Can Trust – For the design, construction, consultant and owner community, you can rely on our extensive building envelope knowledge and experience to assess and validate the design, materials and performance of your building façade components, systems and structures. Global Reach & Access – For product manufacturers, UL’s experienced staff will advise you from the initial design stage of product development through testing and production. Our experts can assist you in understanding the certification requirements for your specific markets and provide the testing and certification services you need to meet those requirements. Speed & Efficiency – our cost-effective systems and state-of-the-art facilities cut through the red tape and help accelerate your time to market. Fully Accredited – UL is fully accredited so test reports are accepted by all the leading North American certification bodies to help get your products to market fast and efficiently. For more information, visit UL.com/buildingenvelope, contact us by email at buildingenvelope@ul.com or by phone at 855.353.2532.